Clive and Jeanne had always wanted to build their own home. They also wanted to stay in the village they have lived in for so long. With available sites limited, they began to investigate the possibility of building in their garden. 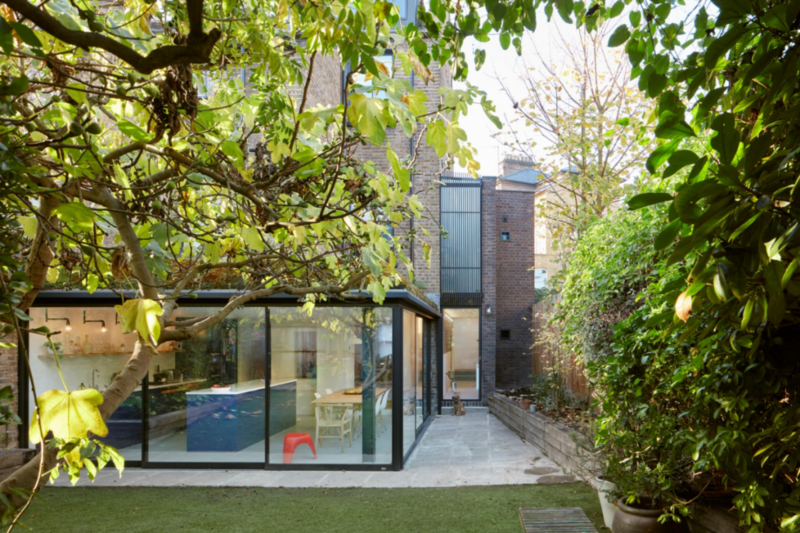 With the help of JOMA Architecture they realised their garden had the potential to provide everything they wanted in their new home. However, even after a prolonged period of consultation with the local authority, planning permission was refused. This presented them with two options, find another site, or challenge the local authority’s decision. Fortunately, Clive and Jeanne had faith in the design, and the decision was overturned on appeal. The resulting house is a 3 bedroom, low energy home built using super insulated masonry cavity walls. The detailed design was optimised to reduce thermal bridging and to keep the building air tight. 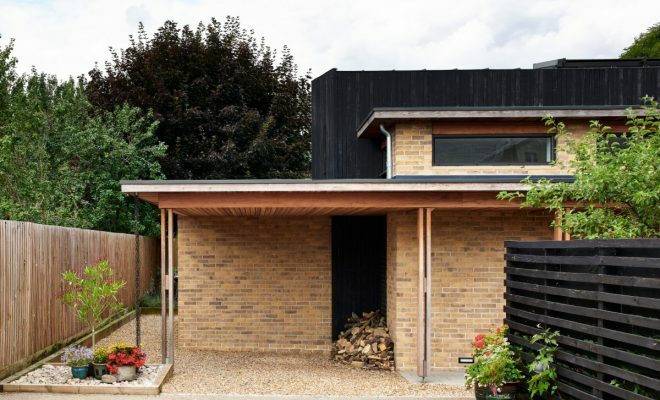 The brickwork was selected to match the local vernacular and the black timber cladding was charred on site (by Clive!) to reflect some of the agricultural buildings in the area. The entrance colonnade of douglas fir twin-columns leads to the bespoke front door. On entering the house you are presented with a linear view through a 4m high frameless window into the rear garden and orchard beyond. This axis connects the open plan kitchen, dining and living space with a wood burning stove at its heart providing Clive and Jeanne with the impressive entertaining space they desired. A full height storage wall has been incorporated to de-clutter the rest of the house. The guest rooms are located on the ground floor of the black box with the master suite above. This impressive room features a sloping ceiling and large picture window to make the most of the views over the orchard to the rear. A simple palette of materials has been used internally to keep the house light and modern but also bring some warmth with the use of timber cladding on the ceilings. The house was a great success and Clive and Jeanne feel the end result perfectly reflects their initial ambitions for their new home. JOMA Architecture is a small, emerging RIBA chartered practice with experience in a range of projects from domestic extensions and one off ‘grand design’ homes through to housing masterplans, museums and school design. We believe it is more important ‘who’ we are working for than ‘what’ we are working on. We offer a full range of traditional architectural services from conception to completion. We excel in sustainable design and its integration into the historic built environment. We also design external spaces and gardens that work in harmony with the buildings around them. We are not bound by pre-conceived ideas or an architectural agenda; our objective is to create thoughtful and pragmatic spaces that responds to our client’s needs and budget and the specific location of the project.